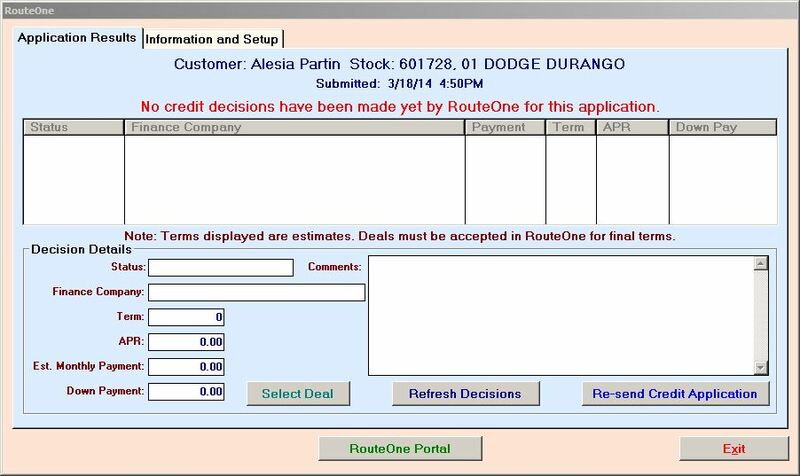 RouteOne does not automatically return decisions to Frazer. You must manually send decisions from the RouteOne website and import them into Frazer. For the deal we just transferred to RouteOne, no decision information has been returned yet, so the window shows that no decisions have been made. You can click "Refresh Decisions" to check for new decisions, or "Re-send Credit Application" to start the process over again. 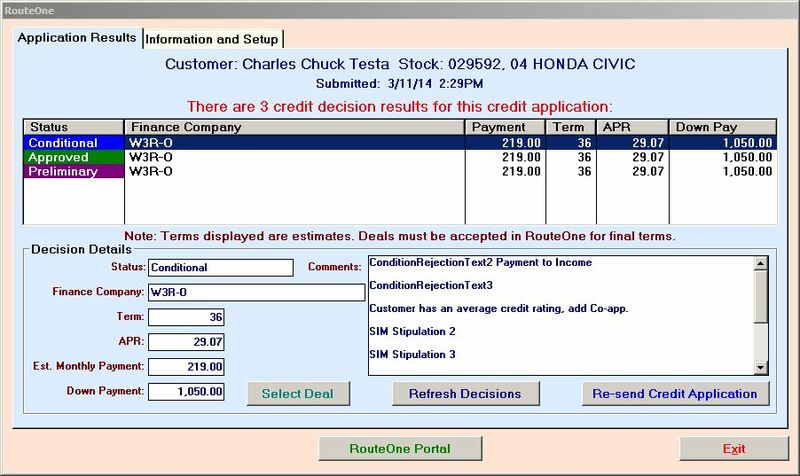 Note: Re-sending the credit app removes all previous decisions for the deal and starts over with a new application from scratch based on the info saved in Frazer. The list will show basic information about any decisions received from finance sources, including the decision status (Approved, Denied, Conditional, Preliminary, Withdrawn, Booked, or New), the finance company the decision is from, comments about the deal from the funding partner/RouteOne, and some estimated approved terms. Decisions sent to Frazer are NOT final. You still need to finalize and book any deals through RouteOne and the financing source directly. You can click "Select Deal" to bring the term, down payment, APR, and finance company name back into Frazer. Changes made to any other part of the application in RouteOne (like names or addresses) are not pulled back to Frazer. Again, if creating a new lien holder in Frazer this only brings in the company's name. Any other info (reserve amounts, addresses, bank fee totals, so on) would need to be obtained from the finance source and entered manually.